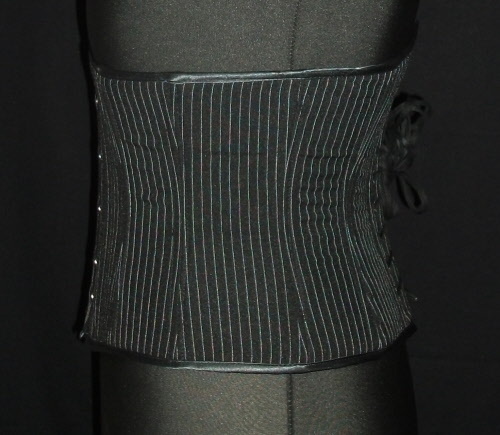 Our waspies are perfect for giving that amazing thin waist that not only pulls your tummy in but shows off the bust! 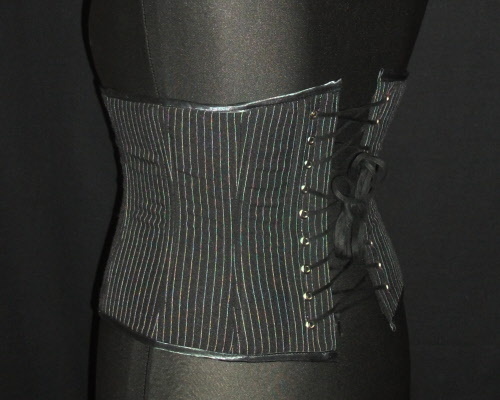 Each has many steel bones to create the shape and prevent "pinching" and also contains our secret ingredient to make them more comfortable to wear! 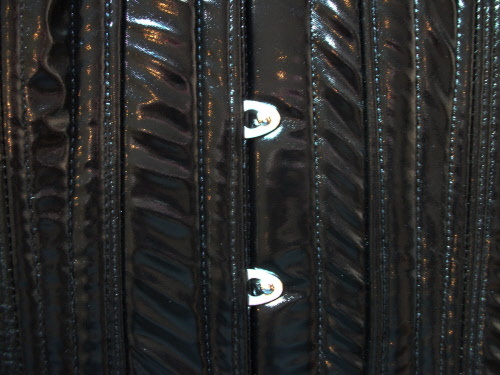 Waspies can give a dramatic effect, pulling you in where you are most flexible. 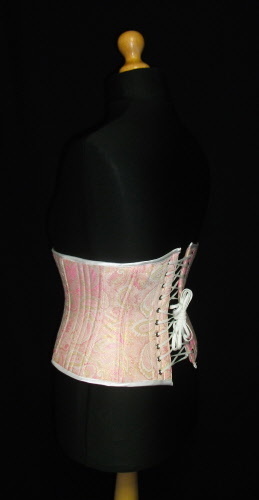 They look great over most clothes but look particularly good with a blouse or over a simple dress. 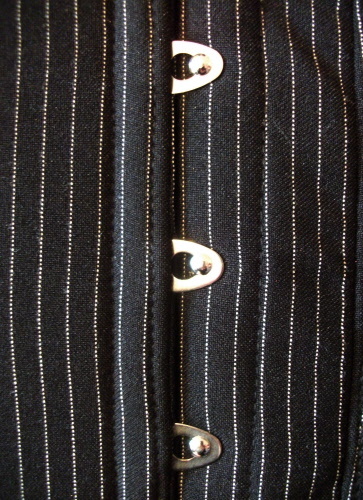 Waspie can have either a traditional busk fastener or our strong zip. 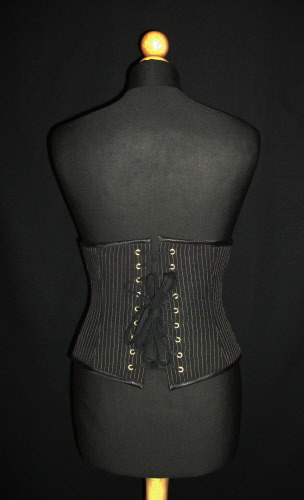 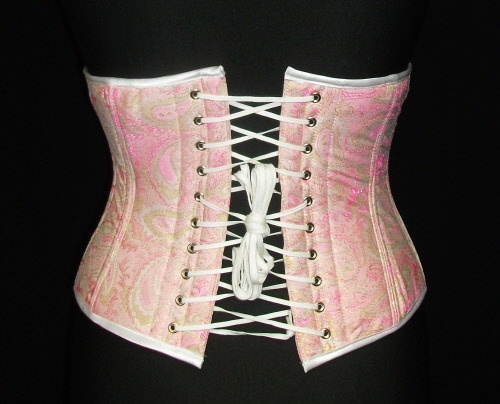 A corset that we're well known for! 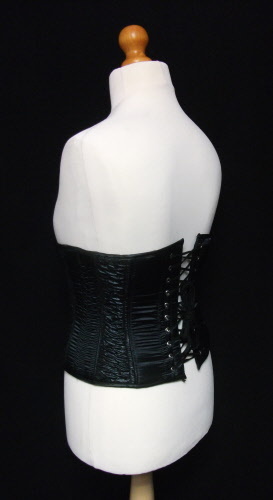 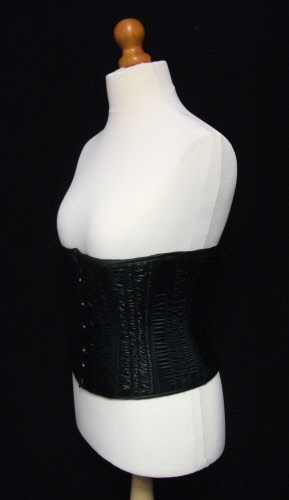 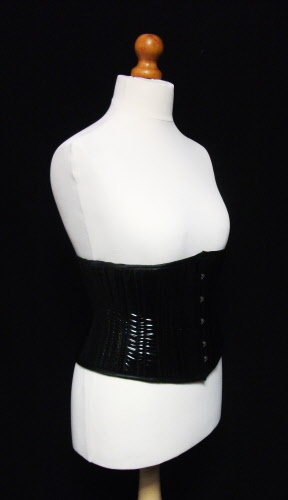 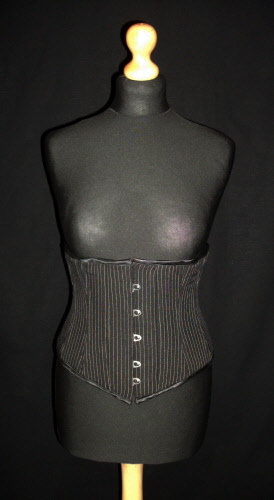 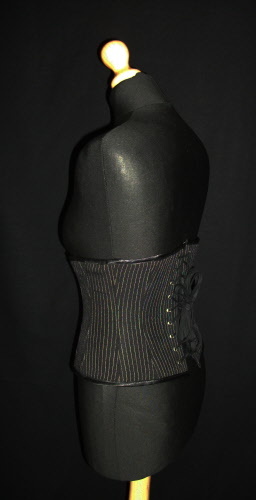 Our design allows the use of this surprisingly soft PVC, that looks and feels great, in a proper body-shaping corset. 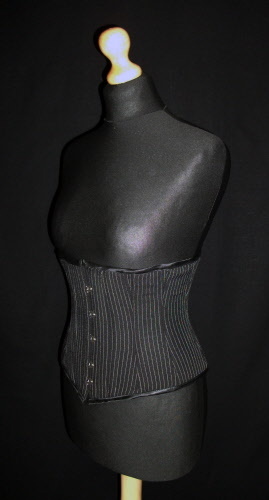 Versatile black pinstripe waspie - one of our best sellers! 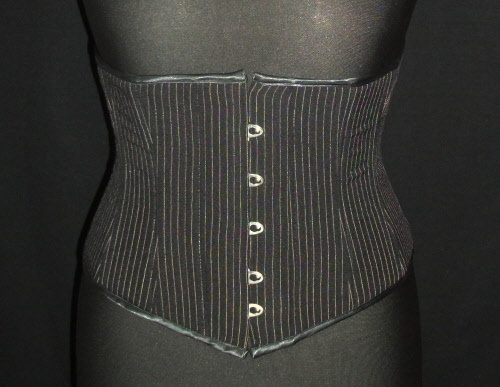 Easy to wear & comfortable for that great narrow shape. 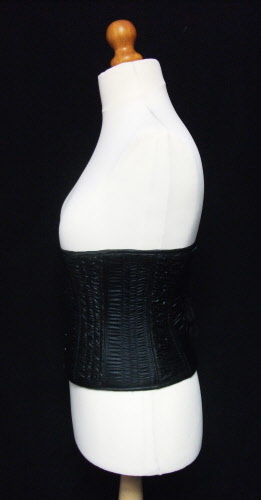 Equally at home making something special out of a black dress or over a white shirt, this corset goes with almost anything! 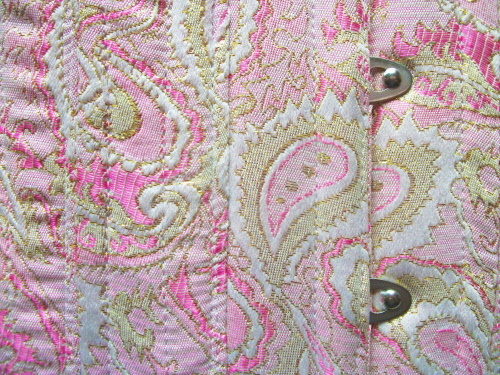 Amazing pink paisley fabric with fine gold highlights makes for a stunning look! 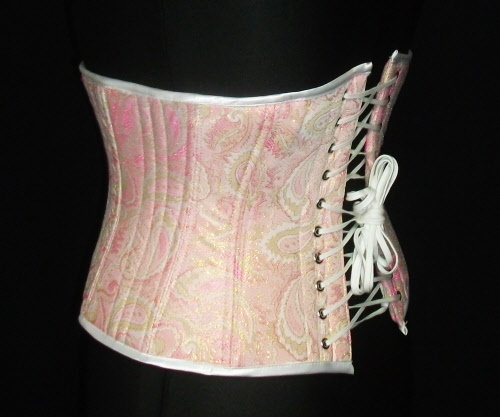 Finished in white duchesse bias and a white lace, this beautiful waspie will pull in your waist to highlight your shape and dress. 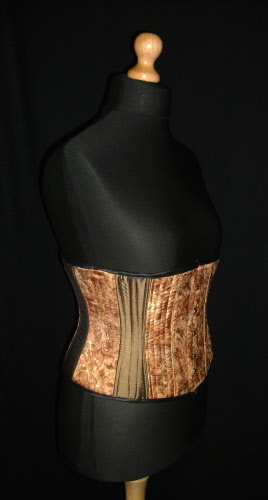 Compliments either light or dark dresses, evening gowns or separates. 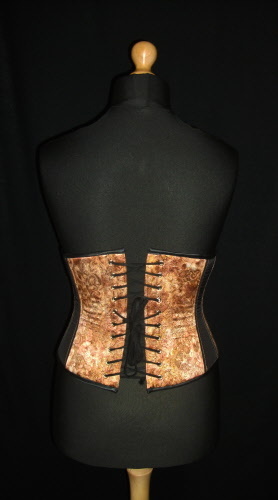 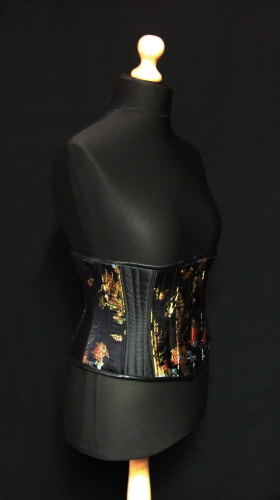 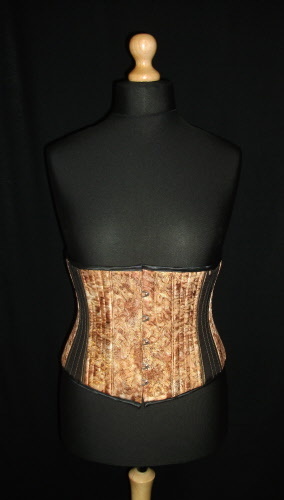 A perfect match of our unique "lava" fabric with black satin panels - we love this corset! 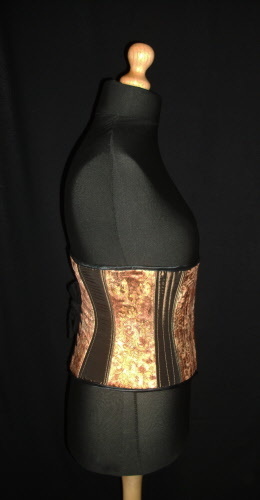 The soft wave-textured lava fabric really makes this waspie stand out as it pulls you in! 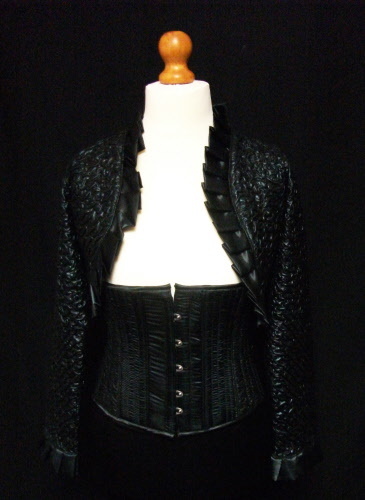 We have skirts and bolero jackets in the same fantastic combination for an outfit that will really make you feel fabulous! 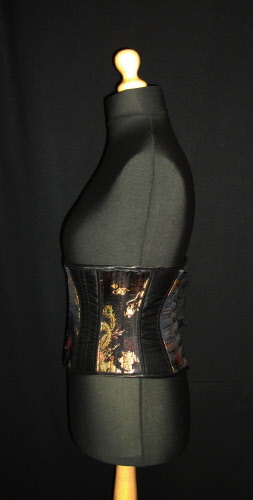 Black dragon brocade satin fabric with black duchesse satin panels to accent the shape. 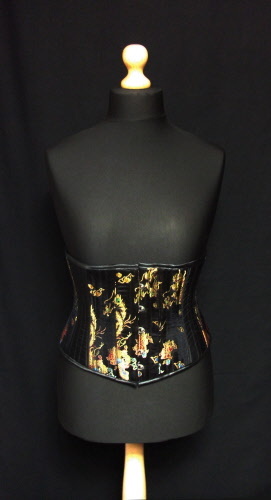 This amazing black satin brocade has stitched Chinese dragon pattern in gold with subtle red, blue, green and yellow highlights. 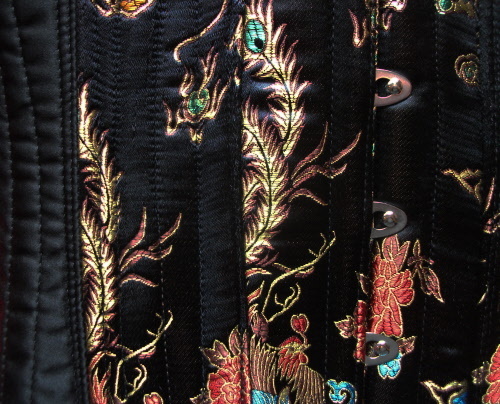 Black duchesse satin panels and bias give a stunning look over black satin or cotton. 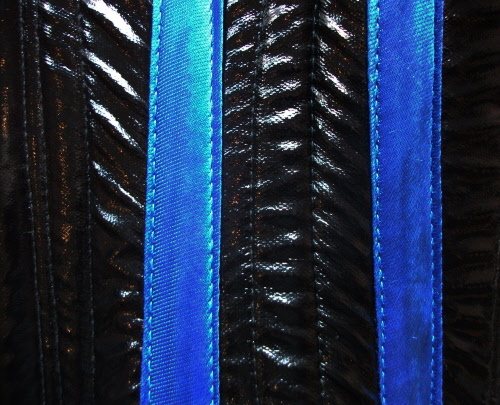 Soft black PVC with bright blue bias stripes. 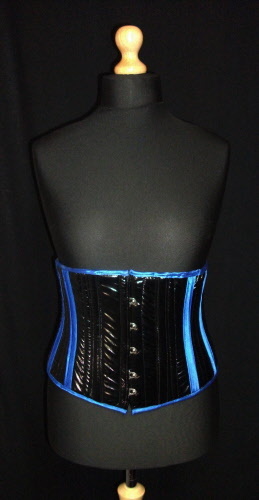 This waspie gives a striking look with shiny soft PVC and bright blue bias that shines under spotlights! 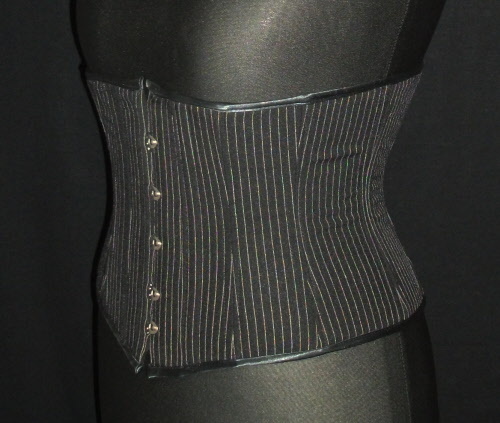 Striking waspie pulls your waist & gets you noticed! 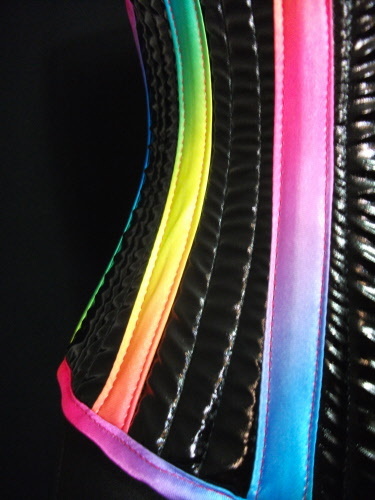 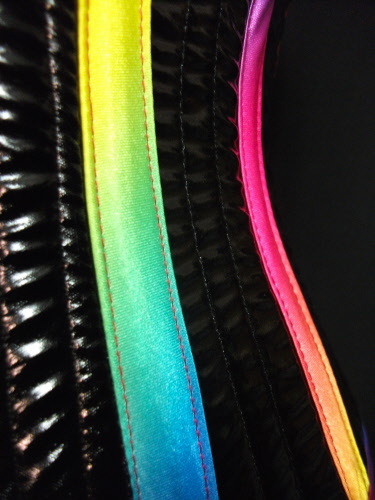 Our soft PVC with bright rainbow bias. 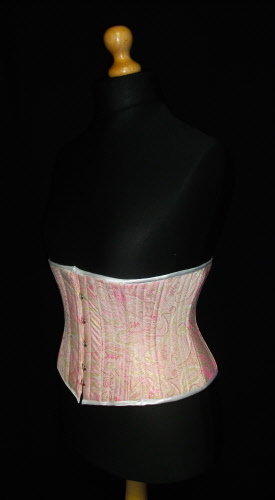 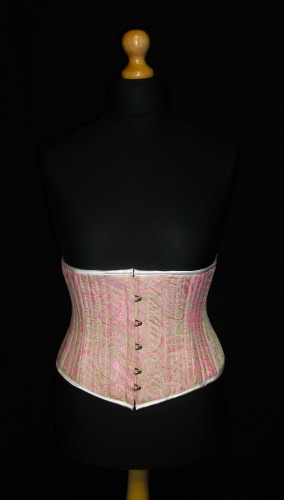 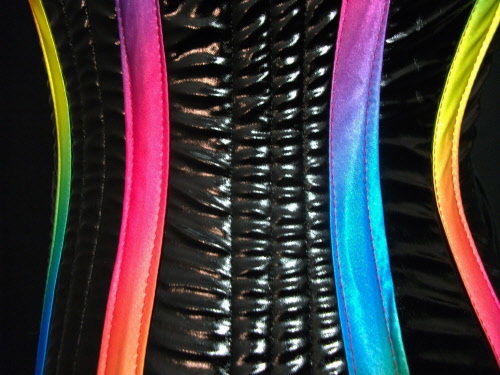 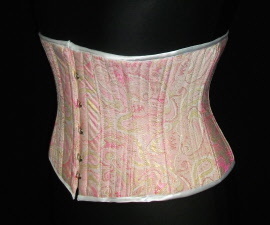 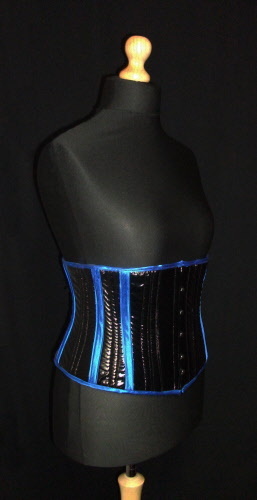 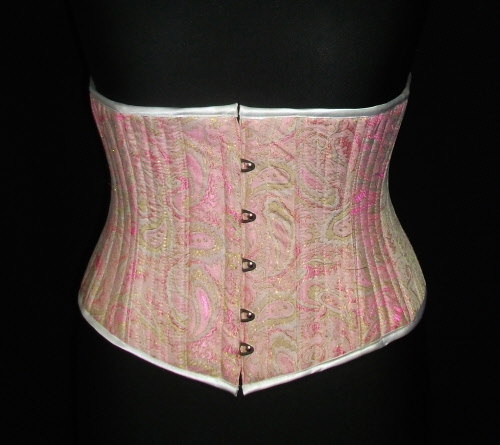 Fabulous corset that really stands out - particularly under UV light! 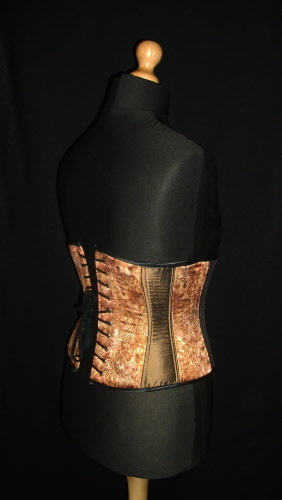 This stunning waspie combines an amazing bronze, cream & gold brocade fabric with bronze taffeta panels. 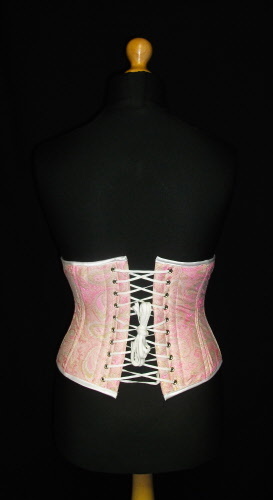 This corset always gets noticed and is one of our favourites. 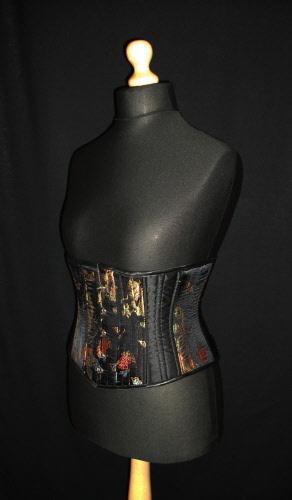 It was inspired by a trip to a great fabric wholesaler next to a tulip field and a canal in the Netherlands! 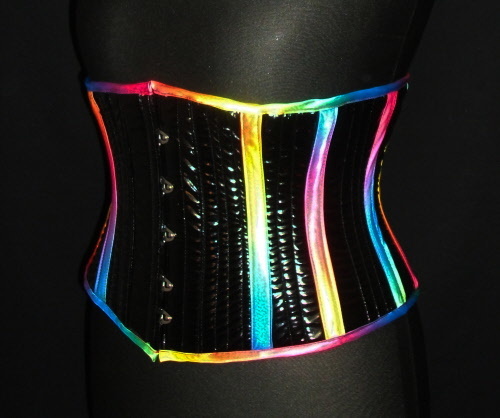 This corset changes colour with the angle of view and the light. 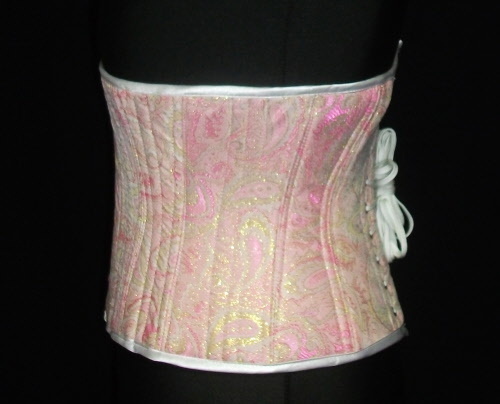 The brocade contains creams, browns, bronze and the gold thread shines under spotlights or sunlight. 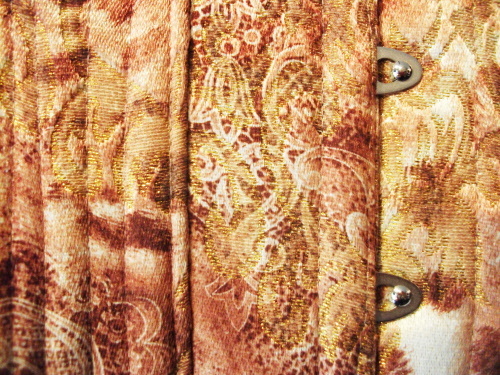 The taffeta panels change from bright & coppery to dark bronze!